Work is no longer a typical 9am-6pm job in the office. It can be at anytime, anywhere. Owing to the global connectivity of the internet, entrepreneurs, independent freelancers, digital nomads, and remote workers can now operate self-autonomously. More and more, location independence is becoming the norm for these millennial career persons. There are currently over 160,000 members worldwide spanning over 3,000 different co-working spaces around the world. Consequently, the international popularity of these shared working spaces—like WeWork in New York, Warner Yard in London, Impact Hub in Manila and Hubud in Bali—is booming. Whether it’s at a surf camp in Indonesia, a traveling bus (Startup Bus), or a catamaran outat sea (Coboat), our modern age has allowed us to tailor almost every aspect of our lives to our very liking. In Manila, places such as Impact Hub are leading the local vanguard, providing members a large, bright space surrounded by cheerful murals and populated with individuals that are just professionally driven, but aspire for purposeful social change. But how can you tell if co-working is really for you? The best and easiest option is to try it out! 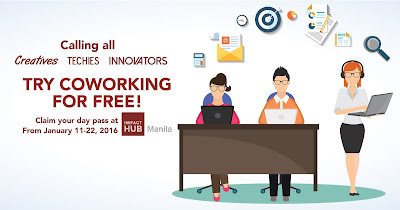 Impact Hub extends a free co-working day passto all social entrepreneurs, creative freelancers, techpreneurs and the whole start-up community in their Makati Office, which is one of 77 globally! To help with the decision process further, we’ve compiled a list of three things to consider below. Co-working spaces usually come with leases or membership fees. Especially for small businesses and early stage enterprises that are bootstrapping their operations, financial limitations are a significant reality. Even for telecommuters, it defeats the purpose if you are spending more for a space than your company or business is earning. When calculating costs, remember to factor in things such as living expenses, commute, internet and associated leisure and utility bills. That said,co-working spaces are often more affordable alternatives to office spaces, coffee shops, or even your own apartment. Plus, the multiple potential benefits are well worth the investment. The many benefits of co-working have been well-documented. A hotbed for entrepreneurial ventures, data suggests that start-ups working out of co-working spaces are four times more successful. Several companies have made their workforce largely remote—including Github, Mozilla, Buzzfeed, Etsy, and WordPress—increasing employee satisfaction and thus improving overall productivity. Compared to working from home, co-working offers less pesky distractions and, in fact, more helpful and supportive opportunities. At the end of the day, the right co-working space should inspire you to get the job done. Across the board, experts agree that the main advantage of co-working spaces is the access one gains to a wide network of peers and like-minded professionals. The chances of you hurdling that obstacle,or unlocking that next breakthrough idea drastically increases with the presence of collaborators around you. Looking for a co-founder, teammate, or just some honest feedback? What better way than to ask a co-worker? With the wide variety of co-working spaces available, so too will you have a diverse pool of talents to connect with and learn from. So what are you waiting for? Grab your laptop and work today from a coworking space, such as Impact Hub and try it out for free. They are located at 5th Floor Green Sun, 2285 Chino Roces Avenue Extension, Makati City, Manila, Philippines. They are an incubator, coworking and events space for a membership community of entrepreneurs, activists, creatives, and professionals taking action to drive positive social and environmental change. With 11,000+ members in 77+ Impact Hubs across the world, the Impact Hub Network has become the center of gravity for people innovating a new kind of economy.